Any older models in magazines these days are either airbrushed and/or botoxed to within an inch of their lives, yet most of them are only 40+. An older woman is only featured if she looks young enough, and that can only be achieved with help.I shall have a look in some of my issues and see if I can find some more pics of Mrs Exeter, and whilst I'm at it, I'll look for Horrockses ads too! Ah thank you! I saw all of the Mrs Exeter images when I was working for the Museums service, but I stupidly didn't scan any of them. Thank you Liz for such very interesting and informative post. 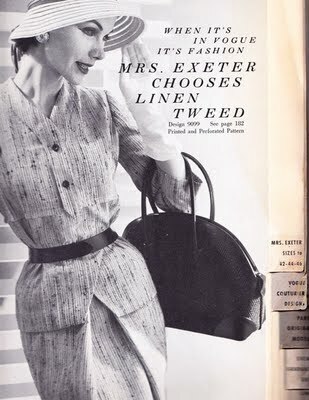 I've just looked through my March 1953 Vogue but sadly no sign of Mrs Exeter. Lots of nice adverts though. In fact 100 pages of them until the contents page, so not much different than today in being top heavy with them. I the models in ads and editorial all look quite 'old' by today's standards. But more to do with they way they were styled as you say. Everyone longed to look all grown up and sophisticated. Even the 'young' styles are shown on a model looking to be in her late 30s by today's standards. Same with celebs and film stars of the day. What a pity that we have now veered in totally the other direction with fashion being portrayed by and aimed at, the impossibly young and beautiful courtesy of almost deformed models and air-brushing. No wonder we all love to gawp at the paparazzi snaps showing celebs in real life in their off-guard moments. 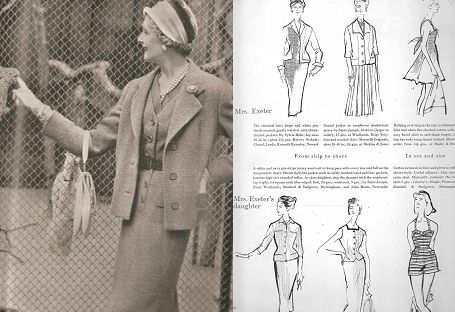 Once these same people would have looked as good off the page or screen as on it, just as would many ordinary housewives and office or factory workers when out in public. Such a loss of feminine dignity and self-confidence in 50 years.